I had the opportunity to go downtown this past Sunday and take my kids and middle school dgroup to serve with Urban Purpose. I feel like my calling for both my kids and dgroup guys is to disciple them. From one angle, it’s scriptural that God puts high priority on caring for the oppressed, needy, and widowed. That is part of God’s’ character and part of God’s will and command in both the Old Testament and New Testament. It’s so important to model this to my kids and my guys and to expose them to these things. Urban Purpose does such a great job with that aspect of ministry and partnering with that ministry is key. For my children and students, everything about the world we live in constantly tells them to put themselves first and serving with Urban Purpose is an opportunity to force them to think about other people. Urban Purpose challenges people to think about others while exposing them to needs right under their own noses. If I’m being honest, I’d say it can be really hard for kids and youth to relate to the people downtown, but I also think that is why it’s so important to go and be involved—it forces them out of their comfort zones and exposes them to needs that they might have otherwise missed. I think it’s invaluable to expose them to that because the motivation for all we do is to be pleasing to the Lord. It’s important to show both my kids and my students that everything isn’t perfect where we live and that ministry doesn’t always have to be deep and intense. Ministry really can be as simple as handing someone a bottle of water or just talking to them about their day or what’s going on in their life. It’s just about showing someone that you care about them and love them. You don’t have to be a super Christian to go and minster downtown. Obviously, Mark, Jim and EG see a different side of things, but the volunteers that go downtown have a great opportunity to just love on people and treat them with respect and love that they may not otherwise get. I really would encourage anyone reading this to go downtown and experience Urban Purpose at least one time. UP does such high quality ministry by fulfilling a unique roll in urban ministry. Not only is serving and loving the needy and broken biblical, but it can also be life-changing. Everyone can’t be committed to everything, but everyone should at least experience the sort of ministry that Urban Purpose does at least one time and see if it is something that God is calling them to be involved in. We have had an incredible year of ministry. We have seen those we work with face real struggles and we are constantly reminded of the real hope we have in the Lord. Be sure to check back here as we highlight some of the stories from this past year over the next couple of weeks. As we look forward to 2014, we trust that the Lord will continue to provide for Urban Purpose as our ministry grows and our expenses increase. Year end giving is vital to our ministry and enables us to finish strong in 2013 while preparing for another year of funding including counseling fees, temporary housing and medication costs. Click here to check out our year end booklet. We are so grateful for those that have supported our ministry financially this year and we ask that you prayerfully consider supporting Urban Purpose in our year end giving. The Lord is growing our ministry and we are consistently working with more people than ever before! With this growth comes a need for our budget to also expand and year end giving is a huge way that happens. As we look forward to 2014, we are grateful for the many ways the Lord has faithfully led and provided for Urban Purpose. God is working in and through Urban Purpose and we are continually thankful that we have the opportunity to be a part of the gospel story in Birmingham. Our ministry would not be possible without the investment of people like you in monetary giving and in gifts of time and prayer. Click here for more information or to donate now. We are so grateful for your support and the way we see it go to change lives! 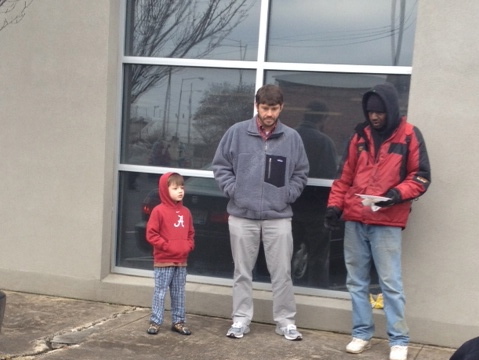 Thank you for being a part of Urban Purpose’s ministry to the broken and needy in Birmingham. Although we face many challenges in our ministry, mental health issues are rapidly becoming the predominant and most difficult issue. We appreciate you following us this week as we blog about this challenge and how we are facing it. Your prayer and financial support is a vital part of the healing process as Urban Purpose walks alongside individuals with great spiritual, mental, and physical needs. Today’s post is by Gwendolyn Crumpton of PRI Counseling. Gwen has partnered with Urban Purpose in staff consultations and her guidance as a counselor is greatly impacting the individuals that see her. We recognize that a healthy mental foundation is key to building a healthy lifestyle both physically and spiritually. We are grateful for her commitment to walk alongside our clients as they seek to function at a healthy level. Gwen’s article provides insight into why counseling is necessary and what the counseling process can look like. As a counselor, I have had the wonderful opportunity to collaborate with the Urban Purpose team (i.e., Jim, Mark, and Emily Grace) with the common goal of “healing” for the people they serve. Urban Purpose serves people in the community that do not have the means and resources to be able to help themselves. These individuals have histories of emotional instability that stems from not only heredity but bad home environments, trauma, and a history of unhealthy relationships. Most of them have not learned to effectively cope with these hardships because they were not given the opportunity to have positive role models in their lives; instead they have coped by abusing drugs, being involved in unhealthy relationships, and making unhealthy decisions. They live a way of life that most of us cannot imagine; they live in “survival mode.” Many of these people suffer from a combination of depression, anxiety, intellectual disabilities, substance abuse/dependence, and Post Traumatic Stress Disorder. Counseling is needed to help them learn new healthy ways to cope with the stress and trauma of life. This cannot be done through 5-10 sessions of counseling; this is an ongoing process because it is learning new ways to cope with life and learning to love themselves as God sees and loves them. Today’s post was written by Dan Lowery, Licensed Psychologist at PRI counseling. Dan has been working with our clients for some months now in weekly counseling therapy and by providing psychological evaluations. Dan’s article provides perspective from a professional’s point of view and gives insight into the needs of the those in need of mental healthcare treatment. Our goal at Urban Purpose is to see those we work with reach a healthy place in every aspect of their lives. This reaches beyond meeting tangible needs like food, clothing and shelter. Physical needs are important, but mental health needs must also be addressed in order for these individuals to be fully healthy and well. Mental health care is very expensive, but worth the cost when it provides individuals with freedom from the past and equips them with the skills they need to move forward fully functioning in a healthy way. We are realizing that though they can take time to identify, almost every person we work with has mental health issues to be addressed. In some instances, this requires in depth counseling; in other instances, medication is needed; sometimes both are necessary. There is always a story behind a person that ends up on the streets and the majority of these stories are full of traumas, disorders and abuse. In the past few months alone, Urban Purpose has worked with people that suffer from severe depression, anxiety, Post-Traumatic Stress Disorder, personality disorders, and multiple other issues. The care required to treat these issues is extensive, expensive, and long-term and we are fortunate to have formed a relationship with the professional team at PRI counseling. PRI is a Christian-based counseling group and we are grateful for their partnership in ministry. The team at PRI uses tools like psychological evaluations to assess the mental state of each individual. The results of the psychological evaluation allow us to identify specific needs and make the best possible plan to achieve total mental health for each individual. Currently, two people we work with are receiving weekly counseling and medication through PRI. In addition, we have plans for three others to begin receiving this mental health care. Though this is a long-term process, we are confident that PRI will be instrumental in getting these individuals to their fully functioning potential. We recognize that with extensive mental health treatment comes a great need for financial support. Mental health care for two people costs approximately $2,200 per month including medication and counseling. We want to be prepared for the upcoming year of ministry and we know that facing the mental needs of those we work with is both vital and costly. We ask that you prayerfully consider partnering with us as we seek to fund these needs. Check back later this week for more information on this issue and how you can be involved. We have two posts coming up written by two of the members of the PRI team that will give some insight into this issue and how the need can be met. For information on supporting our ministry in this way, please contact eg@urbanpurpose.org. We hope that you will keep up with our blog this week as we share more on these needs and how you can be involved!